National joint-stock company Naftogaz Ukrainy, municipal enterprise Kyivteploenergo and public joint-stock company Kyivenergo have signed an amicable agreement, which would allow resuming supplies of heat to consumers in Kyiv, the press service of Naftogaz has reported. 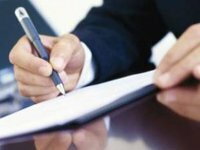 According to the document, Kyivteploenergo confirms the recognition of succession in debt obligations of Kyivenergo to Naftogaz in the amount of almost UAH 2.4 billion. At the same time, the issue of recovery of additional charges is subject to decision by court. According to Naftogaz, on October 10, the business court of Kyiv will approve the signed amicable agreement. This will allow Naftogaz and Kyivteploenergo to conclude contracts for the supply of gas for the production of heat within the period of five working days under the conditions stipulated by the government resolution on the public service obligations (PSO). "We welcome constructive changes in the provision of hot water supply and heating to Kyiv residents under the conditions stipulated by law. After the court approves the amicable agreement, we are ready at any time to sign an agreement on gas supplies with Kyivteploenergo under the conditions stipulated by the government resolution on imposing PSO and we hope that Kyivteploenergo will be able to meet the required conditions for obtaining nominations," First Deputy Head of Naftogaz Serhiy Pereloma said. As reported, Kyivteploenergo adopted a complex of heat and power facilities of Kyiv that are in municipal ownership (including CHPP-5, CHPP-6 and the Energia incineration plant) from the Kyivenergo. Kyivteploenergo could not sign an agreement on gas supplies with Naftogaz Ukrainy, as the company refused to accept debts accumulated by Kyivenergo.